"Red Dragon" would seem to be the redheaded stepchild of the "Hannibal Lector" series. It has the stigma of being both a remake and a sequel. The big surprise is that "Red Dragon" turned out to be the second-best film in the series. I find it hard to write these words because I have been an ardent fan of Michael Mann's stylish "Manhunter" from the beginning. Both film versions of Thomas Harris's book "Red Dragon" are far superior to the noxious "Hannibal." "Red Dragon" was directed by Brett Ratner, soon to helm "Superman." "Red Dragon" remains truer to Thomas Harris's source novel than did "Manhunter." The film's opening and closing provide the biggest treats for fans of the series. This new film version begins with the capture of Dr. Lector (Anthony Hopkins) by agent Will Graham (Edward Norton) of the FBI. This was an element of the novel that was missing from "Manhunter." I'll not spoil the setup, but do watch for Oscar winning composer Lalo Schifrin and John Rubinstein (Zachariah) in small roles during this sequence. To those not familiar with the novel or earlier film version, the plot of "Red Dragon" centers around the FBI's hunt for a serial killer dubbed 'The Tooth Fairy' by the press. Francis 'The Tooth Fairy' Dolarhyde (Ralph Fiennes) has slaughtered two families. The police are stumped. FBI agent Jack Crawford (Harvey Keitel) reaches out to Will Graham for help. Will retired after nearly dying during the capture of Hannibal Lector. Will has retreated to the solitude of the Florida Keys with his wife and child. Crawford convinces Will that his help is needed if another family is to be spared as nocturnal visit by the Tooth Fairy. Graham will only be needed behind the scenes; yeah right! Graham had a knack for thinking like his prey. Will eventually returns to visit Dr. Lector for advice on the case. Sound familiar? Anthony Hopkins success in bringing pure evil to the screen is the reason this film was made. On the face of it, "Red Dragon" seems almost more calculated to make money than the horrendous "Hannibal." That fact makes the film's success all the more amazing. The bulk of the film is quite like "Manhunter" in pacing and tone. Though both film versions of the novel were photographed by Dante Spinotti, they are very different in style. Michael Mann's "Manhunter" was stylish in a "Miami Vice" sort of way. "Red Dragon" has more in common with "The Silence of the Lambs" than the earlier "Manhunter." Director Ratner comports himself well in this film. Though he does rely on the quick-cut shock tactic a few times too many, he created a moody and deliberately paced film. Edward Norton is excellent as Special Agent Graham. So was William L. Peterson in "Manhunter." Norton has a rugged, sun tanned look that is perfect for the role. He is less brooding than Peterson was in the first film. Those who have not seen "Manhunter" will appreciate his performance even more. 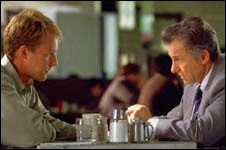 The are many scenes that use much of the same dialogue as the earlier film. I had a hard time not comparing performances as I watched. While Ralph Fiennes is great as the villain, Francis Dolarhyde, I couldn't help thinking how cool it would have been to have Tom Noonan reprise his role from "Manhunter" as the killer. Fiennes is a good actor, but he has the wrong look and build for the part. Francis Dolarhyde was a misshapen giant. His size and facial deformity were important parts of his makeup. Fiennes didn't seem big enough for the part. He is great in the way he captures the emotional distress felt by the psychopath. "Red Dragon" goes into much more detail about Dolarhyde's background. This is a nice touch. Tom Noonan was able to convey the conflict of good and evil within the Dolarhyde character without all of the extra background information. I wonder what he could have done with this script! Harvey Keitel is flat as Jack Crawford. He doesn't have the cocky, self-assurance of Dennis Farina's Crawford from "Manhunter" or Scott Glen's laconic strength from "The Silence of the Lambs." Emily Watson takes of the role played by Joan Allen in "Manhunter." Watson plays Reba McClane, the blind woman who becomes Dolarhyde's lover. Ms. Watson employs the peculiar mannerism of holding her eyes wide open in almost every frame of film. It is as if she is saying, "Hey, My Eyes Don't Work!" This choice on Ms. Watson's part is distracting to the point it almost sinks her performance. The usually wimpy Mary-Louise Parker gets to play a non-victim role for a change. Parker plays Graham's wife. Philip Seymour Hoffman plays the ill-fated tabloid reporter Freddy Lounds. The role was played better in "Manhunter" by Stephen Lang. Brian Cox portrayed Hannibal Lector with great effect in "Manhunter." When I heard that a film version of "The Silence of the Lambs" was being made without Brian Cox, I was disappointed. Then I saw "The Silence of the Lambs." Anthony Hopkins reinvented evil on screen in that 1991-horror classic. In "Red Dragon," Hopkins once again brings a mixture of elan and menace to the screen. At times, his performance comes dangerously close to parody, but a twitch here, and a shadow in his eyes there, soon chills the viewer"s blood once more. Hopkins resurrects the Lector of "The Silence of the Lambs" and removes the 'serial-killer-as-superhero' taint raised in the movie "Hannibal." Ted Tally wrote the scripts for both "The Silence of the Lambs" and "Red Dragon." Hiring Mr. Tally was a wise choice. His additions to Anthony Hopkins' role match the tone of the book. Lector was but a small part of the novel and first film. For obvious reasons, the part had to be enlarged in "Red Dragon" In "Manhunter," Graham visits Lector under the pretense of asking for his help. In fact, Graham has been away from the hunt for a long time. He just wants to get the scent of a psycho back in his nose. In "Red Dragon" Tally builds on that premise, but has Graham also deal with his fears. Graham is seeking some sort of closure with Lector in "Red Dragon." Danny Elfman's score is powerful. Look for an Oscar nomination for this one. I was reminded of Bernard Herrmann's great Hitchcock scores as I watched the film. "Red Dragon" ends differently than "Manhunter." I both appreciated this and found part of it contrived. There is a scene in which Dolarhyde is presumably killed, but you know that he isn't dead. That gimmick is as old as movies themselves. However, the gimmick is used to set up a final confrontation that is one of the best parts of the newer version. Norton delivers a powerful performance during this scene. The movie ends with a nice teaser that is designed to lead right into "The Silence of the Lambs." With "Red Dragon," Hannibal Lector has come full circle to a satisfying conclusion. By returning Hannibal to his origins, the mess that was "Hannibal" becomes just a bad memory.